The CCAD module Work Sheet is used for the preparation of working papers for a model. The application work sheet was developed by RG Technologies in close dialogue with users of the leather industry. Only in this way it was possible to detect and satisfy all requirements which are involved in creating working papers. The CCAD Work Sheet is suitable for all industries that combine graphical data with text in their working papers. CCAD Work Sheet is an important part of production planning within the production process. All necessary working steps for the production of the product are described in detail in the Work Sheet including the patterns of CCAD Design. The implementation of the working steps can be illustrated with photos and pictures. Complicated operations are visualized with this possibility and are easier to implement in the later production. Possible sources of error in the production can be greatly reduced. The Work Sheet can accompany a model or a model series through the entire production process. The Work Sheet gives direct and precise information for uncertainties and further queries relating to individual working steps. With CCAD Work Sheet RG Technologies offers the product for a quick and easy creation of working papers. The Work Sheet provides the best possible support for error-free run of your product through the production process. The basis for the Work Sheet is the technical elaboration of the model from the CCAD Design. Within a Work Sheet the working steps are described by using text and graphics. The import of models from other systems is also possible, equivalent to the other CCAD modules. The working steps described with text are selected from a multilingual working step catalogue. The catalogue can either be generated and maintained on CCAD, or transferred from a connected system through an automated interface. The working steps are grouped into different areas and working step groups. Thus, the assignment of operations to the patterns remains simple, clear and fast even with a very extensive working step catalogue. Any text can be added with other production notes beyond the actual working step. There is a variety of symbols and codes available for operations graphically illustrated and described. The models can be included in various views and any number in the Work Sheet. Possible is the technical design, exploded views of the patterns, as well as the display of individual model areas. For individual working areas additional photos can be included in the technical drawing. So working steps are represented exactly. Material structures and characteristics can be displayed with or without pattern. Operations between two areas can be narrowed down with arrows or similar symbols. 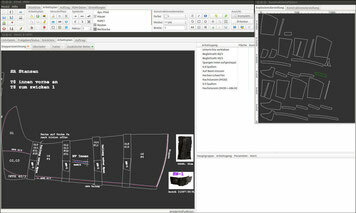 Functions to define working steps like seams, foldings and sharpening edges simplify the creation of the working sheet. Work Sheets can be interactively issued and sent in multiple languages. The display of the Work Sheets in other systems is easily possible. The form on which the Work Sheet is finally issued can be arranged by the user according to his needs. For this purpos we use the CCAD Form Designer. The page number for the output is arbitrary. The Work Sheet can be issued related to single departments. Our project management supports you before and during installation in questions about the functions of CCAD Work Sheet and output of the form. Please contact us for more information to this topic.